A sizeable slice of land owned by Hancock Timber Management near the Chewelah Golf Course could become a slice of heaven for local residents as a local community effort is underway to purchase the land for a “community forest of sorts” to be an accessible area for outdoor recreation. 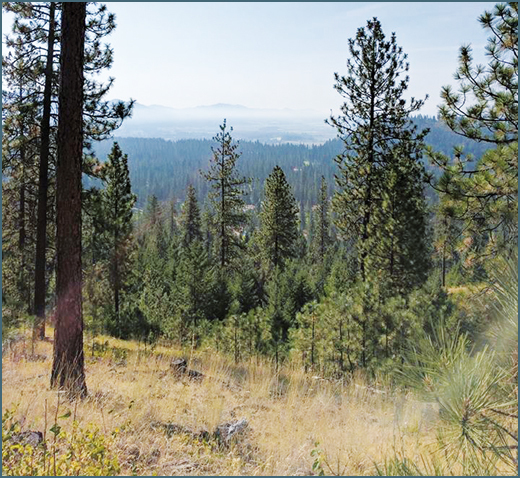 The Chewelah Valley Land Trust, a 501(c)3 non-profit, is hoping to preserve a 400-acre chunk of land north of the golf course for continued use by outdoor enthusiasts. According to one of the Trust’s members, Jake Wilson – who is co-owner of the Quartzite Brewing Company in town – Hancock has been gracious so far in letting people access the land for outdoor needs, and they’ve already been receptive to the idea of selling it to the Trust, even holding it off the market until the group can come up with the needed funds. And through the DNR’s community forest grants, the local group could get the funds or at least part of them in the next Washington State capital budget. After applying for the grant, Wilson said that the Chewelah Valley Land Trust is currently sitting third on the list for projects to receive funds. Current residents up at the golf course might already be familiar with the land as it is used by many. The focus for the land trust would be to maintain trails, manage the land to prevent fire danger and continue to enhance the 400 acres for public outdoor use. “We could even see a partnership with the Chewelah School District for science education on the land or maybe use the land for a PE class,” Wilson said. The idea of the Chewelah Land Trust is to set aside land to ensure Chewelah continues to have accessible green space near town for residents to use. While the thought of running out of land to recreate on might seem ridiculous in outdoor-glutted NE Washington, Wilson pointed out that public green spaces like this need to be preserved as outside buyers could use it for something else. The 400-acre pine forest piece in question offers awesome views of town, with old skid roads providing some good mountain biking and hiking. Wilson pointed out that while the northern part of Stevens County has a lot of Forest Service trails and recreation opportunities, that is somewhat less an option here in the southern central part of the county. At least, trails and areas that people know they have access to. Legislative District 7 State Senator Shelly Short has shown interest and support in the project, and while the capital budget can be a source of some drama in Olympia, if the funds are approved it could be a big step for the land trust. Wilson said the Trust could join forces with the Evergreen East Mountain Bike Alliance, which could help with maintaining and designing trails while also handling some of the liability insurance. He also added that despite this partnership, the land would be used for a multitude of things and not just mountain biking. “They just have a tremendous amount of resources and knowledge when it comes to trails,” Wilson said. Quartzite Brewing Company is planning an upcoming trivia night to raise money for the land trust. Overall it appears the wheels are moving in the effort to set aside a green space for the community. While projects like these take time, the end result is usually felt in the future when the community can continue to enjoy a piece of land for public outdoor use.